According to a new Washington Post-ABC News poll 58% of Americans prefer that the debt ceiling issue should be handled separately from the debate on spending cuts, while 36% favor linking the two. In another sign of the president's improving prospects for reelection, a new survey by Bloomberg Global reports that investors around the world increasingly prefer President Obama to Mitt Romney in the presidential election, 49% to 38%. As recently as two months ago, the candidates were tied in the poll. A new survey by Gallup reports that President Obama has dropped to a new low approval rate of 26% for his handling of the economy, down 11 points since it was last measured it in mid-May and well below his previous low of 35% in November 2010. He fares equally poorly on his his handling of the federal budget deficit (24%) and creating jobs (29%). A Pew Research poll reports that "the public's economic optimism is now at its lowest point since July 2008, shortly before the financial crisis." According to the survey, 29% of respondents expect that economic conditions will be better a year from now; 23% say things will be worse. Last October, a considerable plurality of respondents said the economy would be better, rather than worse, in a year (35% vs. 16%). A just released McClatchy-Marist Poll reports that 40% of Americans approve of how President Obama is dealing with the economy; 57% disapprove. These numbers represent the lowest marks of his presidency. According to a new Democracy Corps poll, the Republican plan to reduce the deficit is supported by 48% of respondents, "but when voters learn almost anything about it, they turn sharply and intensely against it . . . When the budget is described -- using as much of Paul Ryan's description as possible -- support collapses to 36% with just 19% strongly supporting the plan. The facts in the budget lose people almost immediately -- dropping 12 points. Putting the spotlight on this budget is damning. A large majority of 56% oppose it, 42% strongly. The impact is much stronger with seniors where support erodes from 48% to just 32%, with 57% opposed. Support with independents drops from 55% to 43%." While a just released CNN/Opinion Research poll reports that a bare majority of Americans -- 51% -- approve of President Obama's job performance, 60% disapprove of his handling of the economy (with 39% approving), the largest level of disapproval on the issue in his presidency. A new ABC News/Washington Post poll reports that Americans disapprove of President Obama's handling of the economy--just 43% approve of the way President Obama--but just as significant, 46% say they trust Obama on the issue as compared to 34% who trust Republicans. The poll continues: "What's more, by a 9-point margin Americans now see Obama as better able to handle the deficit than GOP lawmakers in Congress. That represents an 11-point drop for the GOP since December -- a period when Republicans have made cutting federal spending a centerpiece of their agenda." A just released Gallup poll reports that Americans as a whole are considerably more optimistic about the economy than they have been in years: 41% of Americans believe that the economy is improving, the highest level since Gallup began asking the question in 2008. There is demographic split on the issue, however: the most optimistic Americans are Democrats age 18-29; the least optimistic, Republicans 65 and older. Gallup's Job Creation Index "shows employees' reports of hiring activity at their places of work in January were unchanged, at +10, for the fourth consecutive month. Job creation has been essentially flat after improving steadily over the first half of 2010 and stabilizing at +9 in August and September. Twenty-nine percent of employees nationwide tell Gallup their companies are hiring and 19% say they are letting workers go -- precisely the same as in December, and essentially the same as in November and October." A just released Quinnipiac poll reports that Americans--by a 54% to 43% margin--believe that the economy is improving. By a margin of 46% to 28%, Americans also believe that President Obama's policies are helping rather than hurting the economy. Is The President's Improved Approval Rating A Result Of More Positive Perceptions About The Economy? Is President Obama's improved approval rating related to more positive public perceptions about the economy. A new Pew Research survey suggests that the answer might be yes: the poll reports that "the percentage saying they are hearing mostly bad news about the economy has dropped to its lowest point since the question was first asked in December 2008. . . Currently, 24% say they are hearing mostly bad news, down 15 points from 39% in early December. The proportion saying they are hearing a mix of good and bad news has jumped from 55% last month to 68% in the new survey." According to a new Gallup survey, "Twice as many Americans think the U.S. economy will be better rather than worse in 2011.Americans living in the East and Midwest are a little more optimistic about the economic outlook for 2011 than those living in the South and West. Americans making $75,000 or more in annual income are slightly more optimistic than other Americans, and Democrats are considerably more optimistic than their independent and Republican counterparts." According to a new Bloomberg Poll , a majority of Americans--51%--say they are worse off now than they were two years ago when President Obama took office, compared with 35% who say they're doing better. Bloombeg writes: "Americans have grown more downbeat about the country's future in just the last couple of months, the poll shows. The pessimism cuts across political parties and age groups, and is common to both sexes. The negative sentiment may cast a pall over the holiday shopping season, according to the poll. A plurality of those surveyed -- 46 percent -- expects to spend less this year than last; only 12 percent anticipate spending more. Holiday sales rose by just under a half percent last year after falling by almost 4 percent in 2008." Just as problematic for the Obama Administration: Two thirds of voters now say the country is headed in the wrong direction. A new Allstate/National Journal poll finds that only 20% of Americans believe that the U.S. economy is the world's strongest; nearly half picked China instead. The poll reports: "Looking forward, Americans are somewhat more optimistic about regaining primacy, but still only about one in three expect the U.S. economy to be the world's strongest in 20 years. Nearly three-fifths of those surveyed said that increasing competition from lower-paid workers around the world will keep living standards for average Americans from growing as fast as they did in the past." One political marker to watch for in this year's midterm election in the unemployment rate and job growth. The more quickly the nation recovers from the devastating recession of 2008-2009, the better the chances of the party in power . . . in this case the Democrats. With April's job report in, things could be looking up for the Democrats: employers added 290,000 more jobs, the largest one month gain since March 2006. Still, troubling sings persist: the unemployment rate actually increased to 9.9%, a clear indicator that more Americans are looking for jobs. The New York Times reports that "the American economy added an unexpectedly strong 290,000 jobs in April, while the unemployment rate rose to 9.9 percent, the government said Friday. Analysts had expected a gain of about 190,000 in the month." The pace of job production--as well as the general health of the economy--could have a major impact on fall's election, so this may be a very important story, indeed. Oddly, a string of political victories for the President--from dramatic passage of the health care bill to improvement in many economic indicators--is not translating into improved approval numbers for Obama. A new Citizen Opinion/Democracy Corps poll, for example, reports "a significant drop in the proportion thinking the country is off on the wrong track and a rise in the number who think the economy is improving." Yet, this positive assessment is "not producing a change in political thinking. The Republican 7-point advantage on the economy is unchanged this month. There is no growth in people believing Obama's economic policies have produced a better economy." Indeed, the President's aggregate approval number has never been lower. This pattern is somewhat unusual, given the public's tendency to translate an improving economy into increased support for the administration in power. Stay tuned. According to a new Gallup survey, American remain pessimistic about the economy: "Americans are thinking in terms of years, not months, when pondering how much longer it will be before the U.S. economy starts to recover. The vast majority (67%) believe it will be at least two years before a recovery starts, and nearly half (46%) think it will be at least three years . . . a full third of Americans (34%) say it will be four or more years before a recovery starts, the mean response is 4 ½ years-- putting the average predicted onset of recovery well into 2014." How soon will the recession end? Not so soon, if American perception are correct. According to a newly released Rasmussen survey, "50% of Americans believe the country will still be in recession at the end of 2010 . . . Just 20% disagree and say America will not be in recession by then. 31% aren’t sure. While many economists say the recession is over, 71% of all adults say it is not. 75% of investors still believe the economy is in a recession. Despite signs of economic recovery, "The Rasmussen Consumer Index, which measures the economic confidence of consumers on a daily basis, held relatively steady at 71.8 on Saturday. The index is down four points from two weeks ago and also down four points from a month ago. Consumer confidence is now up 12 points from the beginning of the year. Nationally, just 6% of adults rate the U.S. economy as good or excellent. Fifty-eight percent (58%) give the economy a poor rating. Among men, 8% give the economy a good or excellent rating, but 56% say it's poor. Women are slightly less optimistic--6% rate it as good or excellent, but 59% rate it as poor." The slow but steady upturn in public optimism about the state of the economy has apparent come to a halt, according to a CNN/Opinion Research survey: "Two years into the recession, Americans don't see economic conditions getting better any time soon, and the steady growth in optimism that previous surveys measured throughout the year appears to have stalled . . 34% of those questioned say that things are going well in the country today. That finding is 14 percentage points higher than a year ago but a dip of 3 points since November. 'This the first time in Barack Obama's presidency that this number has gone down,' said Keating Holland, CNN's polling director. According to the survey, 39% of the respondents said the country is still in a downturn, up 6 percentage points from last month. Nearly half of those questioned said the economy has stabilized and a small minority, 15%, think the country is starting to recover." A new Public Policy Polling survey suggests that Americans are ambivalent, at best, about the state of the economy. The poll ""reveals a more pessimistic electorate than we have seen since the early months of 2009, with feelings on the economy turning more negative after months of slight but steady improvement." Who is benefitting from this doubt, Democrats or Republicans? Hard to tell according to PPP: "The country is not ready to listen to a narrative about how Democrats have brought the economy 'back from the brink' and averted an even worse disaster, as articulated by the president in his joint session address to Congress earlier this year. That leaves a lot of receptivity to Republican messages that focus on wasted spending and exploding deficits." Yet, half of the voters in swing (but Republican-leaning) districts continue to "believe that President Obama’s economic recovery plan could help," a number that suggests the economy could still break in favor of Democrats. In another indication that the high unemployment rate is weighing heavily on Americans, Rasmussen reports that most Americans favor extending unemployment benefits for an additional 20 weeks, with 59% favoring the extension of those benefits and 31% opposing it. The economy remains the number one issue for American voters, according to a new analysis by Rasmussen Reports: "No matter how we ask the question, voters continue to put economic issues such as jobs and economic growth highest on their list of concerns. Every night, Rasmussen Reports asks likely voters to choose from a list of five broad issues which is most important to them in terms of how they vote . . . The economy dominated Election 2008 and has been named as the top concern by 37% to 52% of voters every week over the past year. No other issue has risen above 20% among voters. On Election Day, National Security was second, but it has slipped behind fiscal policy concerns and domestic issues in recent weeks.. . . However, the number of voters who see economic issues as most important has slipped somewhat since President Barack Obama was inaugurated in January. 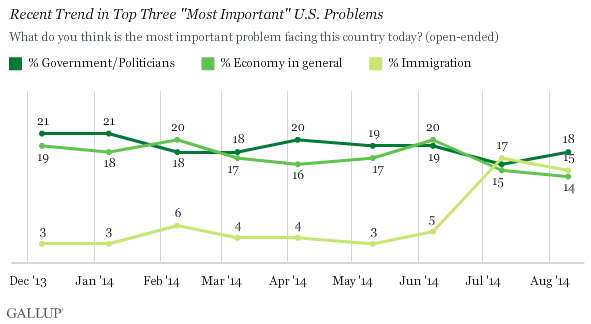 For nearly all of February, 50% or more of voters saw the economy as the top issue. By June, that percentage slipped down to the low 40’s and was down to 37% in late August. It bounced back to 44% for the week ending September 13"
In another sign that economic conditions may be improving in the United States, the Rasmussen Consumer Index, which measures the economic confidence of consumers on a daily basis, reached its high for the year last Thursday. By Sunday, the Index was exactly where it was a week ago and is up eleven points from one month ago. Consumer confidence is now up +19 points from the beginning of 2009. In yet another sign that the American public is sensensing an upturn in the economy--after more than two and a half years of recession--the Rasmussen Consumer Index, which measures the economic confidence of consumers on a daily basis, climbed five points on Sunday, reaching its highest level since the Lehman Brothers collapse in September 2008. At 78.8, the Index is up five points over the past week, up 18 points over the past month and up 19 points from the beginning of this year." Still, the picture is not entirely rosy: "Nationally, 12% of adults rate the economy as good or excellent, while 51% rate the economy as poor. Men (19%) and women (17%) under 40 are slightly more optimistic about the current state of the U.S. economy than men (8%) and women over 40 (6%)." A Gallup poll reveals that when it comes to perceptions about the economy and the current economic crisis, sharp partisan differences prevail: "Republicans and Democrats view economic issues facing the country today from substantially different perspectives. Republicans are most likely to be worried about the increasing federal deficit, increasing federal income taxes, and problems state governments have in funding their budgets, while Democrats are most worried about the rising unemployment rate, Americans without health care insurance, and the increasing cost of health care. These results underscore the political tensions that have arisen as the Obama administration and Congress wrestle with how to fix the country's economic problems, while at the same time dealing with the longer-term impact of those efforts. Taken as a whole, Republicans are more concerned than Democrats about the impact of increased federal and state spending, and government regulation of business, while Democrats are more concerned about the societal problems that the increased spending and regulation are designed to address." In another sign that Americans remain uneasy with the government's economic stimulus plan, a Rasmussen reports survey indicates that 76% of Americans say it is at least somewhat likely that a large amount of money in the $787-billion economic stimulus plan will be wasted due to inadequate government oversight. Nearly half (46%) say it is very likely, according to a new Rasmussen Reports national telephone survey. Only 18% say it is not likely that taxpayer money will be wasted. 65% of Republicans say it is very likely stimulus money will be wasted, a view shared by just 32% of Democrats and the plurality of adults (44%) not affiliated with either party"
According to Gallup, a slightly reduced majority of Americans see the economy as the most serious problem facing the nation: "About two-thirds of Americans, down from 76% last month and 86% in February, say the economy -- or a specific aspect of it -- is the most important problem facing the United States today . . . this is the first month since economic concern surged last fall that fewer than 70% of Americans have named the economy, overall, as the nation's top problem. The finding coincides with significant improvement in public attitudes about the economy, with Gallup's Consumer Mood Index hitting a 16-month high last week. Still, the economy remains the undisputed issue of concern to Americans on Gallup's monthly Most Important Problem measure, with no other single issue named by more than 9%. The current 69% mentioning some aspect of the economy includes 47% citing the economy in general and 14% citing unemployment or the jobs situation. Seven percent mention "lack of money" and 5% the federal budget deficit, while 2% name taxes." According to a DailyKos/Research 2000 poll, 48% of Texas Republicans think their state should be an independent nation while 48% think it should remain part of the United States. Texas Gov. Rick Perry (R) floated the notion of secession at a recent tax protest. Among all Texans, 61% want their state to remain part of the Union while 35% prefer an independent nation. Obama gets almost universal confidence from Democrats, two-thirds support from independents, and just over one-third confidence from Republicans. Geithner appears to be somewhat more politicized than Bernanke. Geithner's confidence rating ranges from 70% among Democrats to just 24% among Republicans. Bernanke, on the other hand, has a more modest 28-point partisan gap, with a 64% confidence rating among Democrats vs. 36% among Republicans. The partisan ratings of Bernanke have shifted from last year, when he was serving under a Republican president. At that time, the Fed chairman received a 61% confidence rating from Republicans, 43% from independents, and just a 40% rating from Democrats. Apparently, Americans associate the Fed chairman with the particular president he happens to be serving under. Democrats have more faith in their leaders than Republicans do in theirs. Seventy-nine percent of Democrats say they have confidence in the Democratic leaders in Congress on the economy. Although this is lower than the confidence Democrats have in Obama, it is higher than the 57% confidence rating Republicans give the Republican leaders in Congress. According to Rasmussen's Consumer Confidence Index, "which measures consumer confidence on a daily basis, gained another three points on Sunday following a five point gain on Saturday. At 77.1, the Index has reached its highest level since last September 20.Consumer confidence is up 9 points from a week ago, 19 points from a month ago, and is even up a point-and-a-half from a year ago. which measures consumer confidence on a daily basis, gained another three points on Sunday following a five point gain on Saturday. At 77.1, the Index has reached its highest level since last September 20. Consumer confidence is up 9 points from a week ago, 19 points from a month ago, and is even up a point-and-a-half from a year ago." Is it a statistical blip or do Americans see the tide turning in a recession that has plagued the nation since December 2007: After five days of steady gains, the Rasmussen Consumer Index, which measures consumer confidence on a daily basis, is now at its highest level of 2009. In fact, confidence is now at the highest level since the morning after Barack Obama was elected President in November. The moved up another point on Sunday to 67.0. That’s up ten points from a week ago and up ten points from a month ago. However, it remains down nine points from a year ago." Only time will tell if we're moving up from the bottom or experiencing a lull in what has been a year-long dowaward spiral. Increase In The Number Of Americans Who Say They Are "Suffering"
The number of Americans who say they are "suffering" as a result of the nation's economic downturn has increased. Gallup reports that the "number of Americans classified as 'suffering' has increased by 3 million over the past year. While an average of 3% of Americans were suffering in February of 2008, the number has remained higher over the past 12 months, consistently between 4% and 5%. While a monthly high of 5% was recorded last June when gas prices spiked, some days in March have reached 6%, suggesting suffering is only on the uptrend." The Gallup-Healthways Life Evaluation Index asks at least 1,000 Americans each day to "evaluate their current lives as well as their expectations of where they will be in five years using a 'ladder' scale with steps number from 0 to 10, where '0' indicates the worst possible life and "10" the best possible life. Americans in the 'thriving' group say that they presently stand on step 7 or higher of the ladder and expect to stand on step 8 or higher five years from now. Americans in the 'suffering' group, on the other hand, say they presently stand on steps 0 to 4 of the ladder and expect to stand on steps 0 to 4 five years from now. Those who are neither thriving nor suffering are considered to be 'struggling.'" Indeed, the public's overall view of the economy remains bleak. According to an Ipsos/McClatchy poll, 57% of Americans believe that the worst is yet to come as far as the economy is concerned. 35% say it has stabilized but not yet begun to improve; only 3% believe the country has turned the corner. When it comes to the economy, Americans are decidedly pessimistic. According to a new Rasmussen Reports survey, 53% now think the United States is at least somewhat likely to enter a 1930’s-like depression within the next few years; 39% think it's unlikely. 19% say a Depression is Very Likely, 7% say it is not at all likely. The latest results are more pessimistic than those found in early January, notes Rasmussen, "when 44% said a 1930’s-like depression was likely in the next few years, and 46% disagreed." Pessimistic or otherwise, Americans also expect "the U.S. economy will be stronger in five years than it is today, but most also expect very little to change in the next 12 months." According to a new Gallup Poll, "Americans' first reactions to President Barack Obama's new 10-year budget plan are more positive than negative, although a sizable group of Americans say they haven't been following news about the plan and have not yet formed an opinion." 44% say their reaction to the new plan is positive and 26% saying it's negative, with the rest having no opinion. There is a clear partisan divide in opinion: "The poll data clearly show that Americans are sharply divided along party lines in their initial reactions to the budget plan, which includes $3.6 trillion in spending in 2010 and a wide variety of spending plans and tax adjustments in the years thereafter. More than 6 in 10 Republicans say their first reaction is negative and nearly 7 in 10 Democrats say their reaction is positive. Reaction to the plan is more evenly divided among independents, but is generally more positive than negative." Americans are growing increasingly gloomy about the economic crisis and their ability to weather it: "The Rasmussen Consumer Index, which measures consumer confidence on a daily basis, fell two points on Monday to 55.5. That’s the lowest level of confidence ever recorded in the seven-year history of the Consumer Index, and the fourth time a new low has been set this month.The Rasmussen Investor Index fell nearly four points on Monday to 56.9, also a record low. For the Investor Index, the previous low had been established in mid-December. The drop for both has been fairly significant. The Consumer Index has fallen eight points over the past month and 39 points over the past year. The Investor Index has fallen nine points over the past month and 45 points over the past year." Following Treasury Secretary Tim Geithner’s presentation of the White House financial rescue plan, the "Rasmussen Consumer Index fell a point-and-a-half to 56.6. That’s another all-time record low, surpassing the mark set ten days ago. During 2008, record lows for consumer confidence were recorded on a regular basis. The Consumer Index, which measures the economic confidence of consumers on a daily basis, is down three points from a week ago and two points from a month ago." President Obama's Monday-night primtime news conference commanded relatively high ratings. According to Nielsen, "The conference was telecast live from 8 to 9PM on 8 networks achieving a combined 30.8 household rating with 49,455,133 viewers. The networks were ABC, CBS, FOX, NBC, Univision, CNN, Fox News Channel and MSNBC. Just weeks after his inauguration in 1993 President Bill Clinton also held a prime time news conference. That event focused on the economy and was carried by 4 networks on February 15, 1993. The sum of the audience of those networks was a 42.1 household rating with 64,300,000 viewers on average. On October 11, 2001, exactly a month after the attacks of September 11, President Bush held a prime time news conference that was carried by 7 networks. The sum of those networks’ audience from approximately 8-8:45PM was a 42.0 household rating with 64,813,000 viewers." According to a new Gallup poll, the American public gives President Obama a strong 67% approval rating for the way in which he is handling the government's efforts to pass an economic stimulus bill, while the Democrats and, in particular, the Republicans in Congress receive much lower approval ratings of 48% and 31%, respectively. Americans Divided On President Obama's Warning About Economic "Catastrophe"
According to a new Rasmussen poll, Americans are almost evenly divided on whether the failure to pass the economic recovery bill working its way through Congress would be a "catastrophe" for the American economy. The survey finds that 44% of Americans agree with Obama and 41% do not. "There is a huge partisan divide on the question. Sixty-nine percent 69% of Democrats agree with the president's insistence that failure to pass a bill now means catastrophe, while 64% of Republicans do not. Among voters not affiliated with either major party, 32% say Obama's right, but 51% don't agree." In a sign of growing voter concern and pessimism over the economy, a new Rasmussen survey reports that "50% of U.S. voters say the final economic recovery plan that emerges from Congress is at least somewhat likely to make things worse rather than better, but 39% say such an outcome is not likely. 27% say the final legislation is Very Likely to make things worse, while just 7% say it’s Not at All Likely to have that effect." Right now voters seem prepared to give President Obama the benefit of the doubt: "Part of this concern is a natural reflection of voter skepticism about the legislative process. Many Americans simply accept the notion that no matter how bad things are, Congress could make them worse." According to a new poll, a scant majority of Americans support President Obama's proposed economic stimulous package pass by the House last night: "As President Barack Obama tries to win over reluctant Republicans on his economic stimulus plan, a slim majority of the American public wants to see Congress pass the roughly $800 billion package of new government spending and tax breaks . . . 52% of the nation's adults are in favor of Congress passing the plan and 37% are opposed, while 11% have no opinion." A new Rasmussen survey, however, shows support for the package dipping well below maojority numbers: in the poll, likely voters support the measure 42% to 39% with 19% undecided. With just a few weeks until Obama's inauguration, Americans remain worried and cautious about the state of energy and the nation's dependence on gasoline and other fossil fules. Nearly two in three Americans (64%)--according to a recent Gallup survey--report adjusting their driving habits in significant ways in response to surging gas prices earlier this year, but only 12% have reverted to their old habits as prices at the pump have plunged. Even as the price of a gallon of gas has fallen below $2 in most areas, 52% of Americans say they have not gone back to their old driving habits." These numbers suggest that Americans are reacting not only to the gravity of the energy crisis, but also are anxious about the economy and the effect of high energy and oil prices on their pocketbooks. As Gallup concludes: "the plunge in gas prices is similar to distributing a huge tax rebate by how much individuals drive. Like the tax rebate from earlier this year, lower-income Americans tend to be most likely to spend the rebate, but all Americans are likely to save a large portion of any tax rebate. In part, it may be that most Americans have not gone back to their old driving habits for fear that pump prices will surge once more in the future. Just as likely, however, particularly for upper-income Americans, returning to old driving habits may be a lot like spending money -- something left for better times." It will be interesting to see the public response to energy use if oil prices begin to climb, the response of the White House and Congress, and the effect of both on the public's accessment of the Obama administration in the coming year. Over the next week, PollTrack will publish a daily, six-part series--Obama's America: The State Of The Nation--that will examine public opinion and the attitudes of American voters about a range of issues facing the new president, from the economy and energy to voter expectations about the new administration. Collectively the series will offer a comprehensive look at the state of the nation through public opinion on the ground as Obama takes office. Today's topic: The Economy. Public reaction and response to the economic crisis has been mixed in recent weeks. For one, voters remain pessimistic about the economy: Nationally, only 9% of adults rate the economy as either good or excellent. 61% disagree and say the economy is in poor condition. Voters tend to support president-elect Obama's proposal for a comprehensive and massive stilumlous package: 56% of respondents say they favor the stimulus package that President-elect Barack Obama is proposing; 42% were opposed.The poll concludes: "Two-thirds of the public thinks the stimulus package will do just that, with 17% saying it will help the economy a lot and another 50% feeling that it will help the economy somewhat. 21% percent say the stimulus package won't help the economy very much and 10% say it won't help at all." Yet, the recent economic crisis had led led "mixed feelings" about government intervention: 70% of respondents say a free market is better than one managed by the government. Just 15% prefer a government-managed economy. 15% remain undecided. Still, a majority of voters--a healthy 52%--also believe there is a need for more government regulation of big business, although 35% disagree. 13% are unsure. These numbers suggest a highly vulnerable electorate, uncertain of the best way to handle the present economic crisis, unsure of how much government can do, but generally confident in the new president's ability to handle the situation. Americans remain optimistic about 2009, but still fear the effects of a recession most believe will be long-term. According to a new poll, Americans have a bit more confidence in 2009 than in the year that just passed, but 50% of adults believe the country will still be in a recession this time next year. 24% say 2008 was a good or excellent year, and 3% say it was the best year ever . . . 38% rate 2008 as poor. 32% expect 2009 to be good or excellent, with 5% more predicting it will be the best ever. 23% say it’s going to be a poor year." By contrast, a year ago 54% rated 2007 as either good, excellent or one of the best years ever for them personally. Only 20% gave it poor marks. 68% expected 2008 to be excellent, good or the best, with just 7% predicting poor. Are Americans getting a bit more optimistic about the ailing economy during this holiday seasn. A new Rasmusen Consumer Index survey suggests that consumers are less anxious than they were even a week or two ago: The Consumer Index, which measures the "economic confidence of consumers on a daily basis, rose a point on Monday to 61.9, its highest reading since December 12. Today's index is up two points from last week, but is down two points from the first reading of the month." Any improvement in Americans perception of the economy will be helpful to presisdent-elect Obama, whose first priority is to restore confidence in a public (and business community) that as grown increasingly pessimistic about the future. A new Rasmussen Reports survey suggests that Americans are not expecting an upturn in the economy any time soon. Nationally, only 9% of adults rate the economy as either good or excellent. 61% disagree and say the economy is in poor condition. American voters have mixed feelings about government's role in managing the economy, according to a new Rasmussen Reports survey. 70% of respondents say a free market is better than one managed by the government. Just 15% prefer a government-managed economy. 15% remain undecided. But as Rasmussen notes, the recent economic crisis had led led "mixed feelings" about government intervention: a majority of voters--a healthy 52%--also believe there is a need for more government regulation of big business, although 35% disagree. 13% are unsure.The survey concludes that voters overall "are more ambivalent about the federal government’s role in the current economic crisis. 48% worry the government will do too much, while 41% fear it will do too little. 11% are not sure which is a greater concern. Nearly two-thirds (65%) of voters agree, however, that government and big business often work together in ways that hurt consumers and investors. Only 15% of voters don’t believe that is true, and 20% are undecided." This ambivalence suggests a very tricky political landscape for the incoming president who must balance the need for federal regulation with broadly held views about American capitalism and economic freedom and self-determination. According to a new CNN/Opinion Research survey, 56% of respondents say they favor the stimulus package that President-elect Barack Obama is proposing; 42% were opposed.The poll concludes: "Two-thirds of the public thinks the stimulus package will do just that, with 17% saying it will help the economy a lot and another 50% feeling that it will help the economy somewhat. 21% percent say the stimulus package won't help the economy very much and 10% say it won't help at all. Yet, respondents appear to be split on the issue of government regulation of business and industry, with "39% saying there's too much government regulation and an equal amount saying too little. 20% said the amount of government involvement is just right." In a new hurdle for the incoming Obama administration, voters are growing increasingly pessimistic about their personal finances. According to a new Gallup survey, About 40% of Americans on average are "currently worrying about money, sustaining a slight but significant increase in worry compared to readings before September of this year . . . Americans' self-reports that they worried about money began 2008 near 30% on average, and then rose to an average of about 35% through the end of the summer. Then, as was the case for other consumer economic measures Gallup tracks, financial worry begin to rise in mid- to late September, coincident with the highly publicized credit crisis. The average worry level peaked at about 45% in early October, and has fallen back slightly since, generally remaining above the 40% level. The notable exception was a drop in financial worry around the Thanksgiving holiday . . . The large sample sizes involved in this tracking -- about 3,500 interviews per seven-day rolling average -- underscore the conclusion that while the increase in worry is not large on an absolute basis, it is significant and meaningful." PollTrack notes that such negative sentiment can actually contribute to an economic downturn, functioning as a kind of self-fulfilling prophecy in which consumers--fearful of their personal economic future--begin to radically alter their spending habits. A new poll out from Rasmussen reports that a majority of voters are confident that Obama--and his economic team--can solve the nation's economic woes: "55% of Americans are at least somewhat confident that Barack Obama's economic team can lead the country out of its current economic problems. 25% are very confident. Only 13% are not at all confident in the new team, and 5% are undecided." Interestingly, investors are less enthusiastic about the Obama economic team, with 48% somewhat confident in the president-elect’s choices, including 20% who are very confident. 63% of non-investors are somewhar confident, while 32% are very confident. 16% of investors are not at all confident in the new economic team, compared to 10% of non-investors. but also said the economy 'is likely to get worse before it gets better. '” The ABC News analysis continues: "Given the larger forces at work, relatively few Americans, 24 percent overall, expect the incoming president to be able to do 'a great deal' to improve the economy. That’s even though it was the single most dominant issue of the campaign, and Obama’s ability to connect with the public’s economic concerns that lifted him to his Nov. 4 victory." Why Obama Won: "The Fundamentals Of The Economy Are Strong"
On 18 September 2008, PollTrack's tally of electoral votes was starting to suggest that McCain was beginning to pull ahead of Obama: McCain-216 Obama-202 Too Close To Call-120. In the following weeks these numbers would steadily reverse in the wake of a comment made by the Republican nominee just days before the harrowing dimensions of the Wall Street Crisis and subsequent economic meltdown would be known: "The fundamentals of the economy are strong." When the history of the extraordinary 2008 campaign is written, it is this sentence that will read as one of the greatest game changers of the race. The remark, in and of itself, may not have been fatal for another candidate. For McCain, however, it achieved one of the most damaging results in politics--affirming the electorate's underlying anxiety or fears about a candidate. Earlier in the primary season, McCain admitted that the economy was not his strong suit. A nation on the brink of economic disaster is a frightened nation; the gnawing sense that the Republican candidate--not to mention a Republican party widely blamed by voters for the economic mess--was not competent on the economy transformed McCain into the risker choice. Yet, public opinion on the subject changed relatively slowly. On September 20th, PollTrack observed the following: "Gallup reports a slight--but only slight--benefit for Obama in the voters' candidate preferences, vis-a-vis the current economic crisis--'Even though Americans divide evenly as to which candidate can better handle the Wall Street crisis, Barack Obama seems to benefit politically, as slightly more voters say it increases their likelihood of voting for him (29%) than say it makes them more likely to vote for John McCain (23%)'" As time passed, however, and voters became more worried, they took notice of Obama's cool, steady, and authoritative demeanor. If voters approached the first debate demoralized and frightened by the economic news that resonated around them, they also approached the event with a sense of longing--desire for problem solving and intelligent, wise leadership and action. In the end, many voters felt safe with the Democrat, unnerved by the Republican, and desirous of change. How Scared Are American Voters? How scared are Americans about the current economic crisis? So afraid, according to analysts that their "confidence may have been too shaken for them to resume their free-spending ways any time soon." This crisis of confidence is, no doubt, an important reason for McCain's dip in the polls. The tendency of most voters to blame the economic meltdown on the present administration--and on Republicans in general--may be transforming McCain into the riskier alternative for many. (According a just released CNN/Opinion Research national survey, "56% say McCain's policies would be the same as Bush's, up from 50% a month ago.") Questions about a candidate's personality, character, patriotism. or identity--directly or indirectly raised by the McCain campaign, for example, with regard to Obama's perceived liberalism, elitism, otherness, or aloofness--can drive an election in a time of relative stability (the ease with which George H. W. Bush was able to paint Michael Dukakis as an elitist, tax-and-spend liberal with un-American values is a case in point). But in a time of war or crisis, voters may be far more inclined to cast their vote for the candidate they believe can best bring about stability or assure their safety (indeed, American voters have not turned out an incumbent president in a time of war, to wit: 2004). The big question: have voters made up their minds? Have they decided that Obama is the more reassuring choice in a frightening time (regardless of their doubts about his experience, race, or politics)? Or can the Republicans reignite voter doubts this week by recirculating stories about the Democrat's controversial associates (such as his former pastor, Rev. Jeremiah Wright, Jr. or Williams Ayers, one of the founders of the radical Weathermen group)? Rasmussen reports that American voters are evenly split on the bailout question: "Voters are evenly divided over whether Congress should take action to help the troubled financial industry or just let Wall Street work out its problems on its own, according to a new Rasmussen Reports national telephone survey. Forty-five percent (45%) say Congress should take action, but 44% say Wall Street and the financial industry should take care of their own problems. Eleven percent (11%) are undecided." A Public Policy Polling survey, released this afternoon, reveals one important reason for Obama's dramatic upswing in North Carolina: the economy. The poll found that, "over the last year there's been a strong relationship between the number of North Carolinians listing the economy as their biggest concern, and Obama's standing in the polls. In January when just 39% of voters said it was their biggest issue John McCain led by 14 points. In August with it up to 48% Obama trailed by just three. Last week with 58% listing it number one the race was tied, and now with the number up to a record 64% Obama has taken a small lead. He is up 55-38 among respondents citing the economy as their main concern." Voters Blame Republicans For Financial Crisis: An Obama Advantage? A CNN/Opinion Research Corporation survey released today reports that registered voters, by a two to one margin "blame Republicans over Democrats for the financial crisis that has swept across the country the past few weeks — one factor that may have contributed to an apparent increase in Barack Obama’s edge over John McCain in the race for the White House." CNN continues: "47 percent of registered voters questioned say Republicans are more responsible for the problems currently facing financial institutions and the stock market, with 24 percent saying Democrats are more responsible. One in five of those polled blame both parties equally, and 8 percent say neither party is to blame." It looks like the race could stay a tie. A new Battleground Tracking poll released this morning continues to show McCain in the lead, 47% to 45%. And the question of the economy may not help Obama break the tie, given the concern of many voters about the Democrat's perceived lack of experience or specific programs. Today, a Rasmussen national survey reports: "Neither presidential candidate has convinced a majority of voters that they know how to handle the country's growing economic crisis, according to a new Rasmussen Reports national telephone survey. Just 24% say it's Very Likely that Barack Obama will bring the kind of change that is needed to Wall Street."